This Hetzer is believed to be one of four purchased by the Swedish Army at the end of World War Two from Norway. They were used by the German Army of occupation in Norway. When they surrendered in 1945 most of their vehicles were in tact unlike those on the Western and Eastern front that had been involved in heavy fighting. Another report says that only one was purchased and that was in 1947 from France. 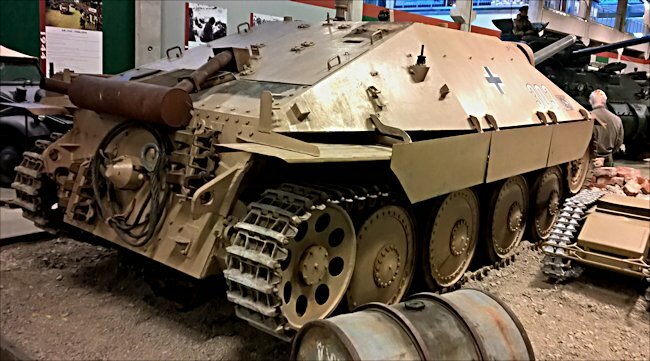 This is an original WW2 Hetzer unlike many of the Hetzers that you see in Museums that were built after the War for the Swiss Army. These are known as the G13 Hetzer. Although this tank destroyer is based on the Czech built Panzer 38(t) light tank chassis there have been some major adjustments from the original tank design. The Hetzer chassis is a lot wider to enable the 75mm gun and drivers position to be accommodated side by side. 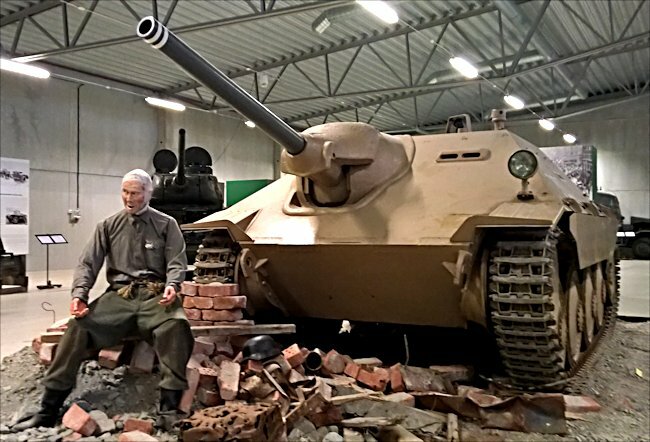 What is interesting in the Swedish Tank museum is that the Hetzer is very near to the licensed Panzer 38(t) Strv m/41 built in Sweden but from the original Panzer 38(t) plans. It enables you to visually compare the width of each vehicle and there is a noticeable difference. The Hetzer looks like the light tank's fat brother. The rear view of the Hetzer. The cone covered the hole used to start the engine with a hand crank. The exhaust was a weak spot as it caught grenades and mines. The German tank crews liked their little tank destroyer. It was reliable, effective and provided adequate armoured protection so long as the front of the Hetzer was facing the enemy. It had proved itself on the battlefield on the Eastern Front in 1944. The German Army recorded that a single company of Jagdpanzer 38(t)s managed to destroy twenty Russian tanks without loss. Another Unit claimed it had knocked out fifty seven armoured vehicles including two IS-2 heavy tanks at a range of 800mm without loss. The 75mm gun could not penetrate the IS-2 tanks front armour but it could penetrate its side armour. Distances covered on the Eastern Front were long. Because the Panzer 38(t) tank had been in production since 1938 many of the early mechanical faults had been corrected. The Hetzer benefitted from being built around a Panzer 38(t) tank chassis and was a reliable vehicle that rarely suffered mechanical failures. Crews recorded that the sloping front armour of their Hetzer TDs could withstand a direct hit from a Soviet 76.2mm gun fitted to the T34/76 tank but not the larger 85mm armed T34 tanks. The armour also provided adequate protection in Normandy from incoming shells fired by the Allied tank crews using the standard M4 Sherman 75mm gun. Most tank v tank losses were from hits to the rear and side armour. Even though the chassis had been widened on Hetzer, from the normal Panzer 38(t) tank hull, the sloping frontal armour and the large 75mm gun made the crew compartment very cramped for its four man crew. 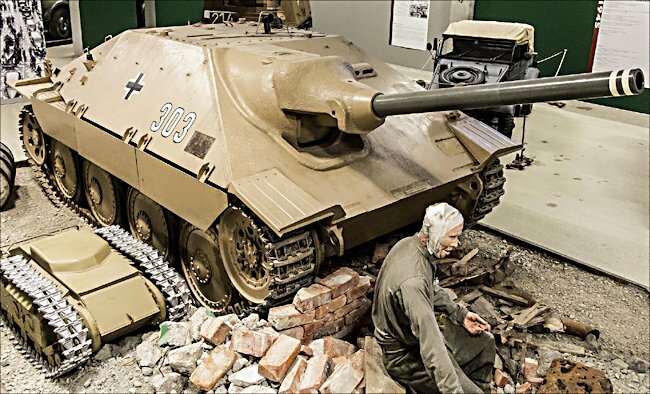 Part of this problem was the designers wish to make the Hetzer have a very low profile so that it could be concealed easily and make a difficult target to seen and be hit. 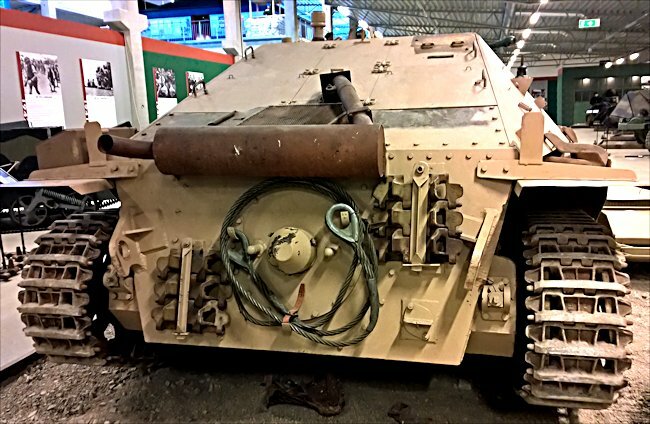 The interior of this tank destroyer was divided up into two compartments. The driver was in the front on the left side of the vehicle. The Gunner and loader were also on the left side of the gun. The Commander was in the rear and right side of the vehicle.